Like most Texas boys of his generation, Steve Austin grew up a fan of professional wrestling. Living in the small Southeastern Texas town of Edna for most of his youth meant that he spent his Saturday nights watching Paul Boesch’s Houston Wrestling, which was just one of the great promotions that ran in Texas during the territorial era. When Steve went to college at the University of North Texas he was introduced to Dallas’s World Class Championship Wrestling, the territory featuring the legendary Von Erich family and a man by the name of “Gentleman” Chris Adams. Steve saw a commercial for Adams’ wrestling school while watching World Class one week, and decided to take a shot at the job he wanted to have when he was seven years old. Steve started out wrestling under his given name of Steve Williams, but when he got a shot in Memphis a few months later due to the merger between WCCW & the CWA, booker Dutch Mantel told Steve that he couldn’t work as Steve Williams since there was already a successful wrestler using that name. Indeed, Steve “Dr. Death” Williams was known across the world as the master of the Oklahoma Stampede, so Steve had to use another name. Dutch came up with Steve Austin, as Austin was the town where Steve was born. Steve didn’t like it because it was the name of the title character on the Six Million Dollar Man television show, but since he couldn’t come up with anything better he became Steve Austin. Once Steve Austin returned to Texas he began a bitter feud with his trainer that gained attention largely due to the involvement of Adams’ ex-wife Jeannie in Austin’s corner going against Adams’ then-wife Toni. The girls going at it added something special to the feud, and it helped Austin gain attention from a major wrestling company. Austin & Jeannie made their way to WCW in 1991, and it wouldn’t be long before “Stunning” Steve & Lady Blossom made an impact. Austin defeated the widely-respected “Beautiful” Bobby Eaton for the Television Championship just weeks after joining the company. It was Austin’s first championship, and it certainly wouldn’t be the last. After a few months Austin cast Lady Blossom aside to join Eaton, Arn Anderson, Larry Zbyszko & “Ravishing” Rick Rude in the Dangerous Alliance. Led by a man then known as Paul E. Dangerously, the Alliance wreaked havoc on WCW for most of 1992 while Austin learned tons from his stable mates & from rivals like Ricky “The Dragon” Steamboat & Barry Windham. 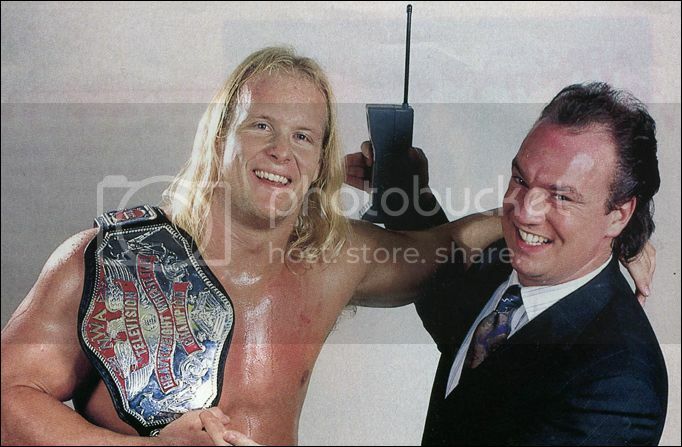 He held the Television Championship for most of this time period and announcers began to hype him as one of WCW’s top future stars. After the Alliance broke up in late 1992, Austin was told he would be paired with Harley Race and receive a big singles push. He was unhappy when plans were changed and he was put in a tag team with Brian Pillman, but what seemed like a disappointment turned out to be another big break for Austin. Pillman’s aerial skills & promo ability along with Austin’s toughness & his own charisma made for the perfect heel tag team. The Hollywood Blondes quickly became the two most despised men in WCW at the time, as fans couldn’t stand the way they’d cheat to defeat Ricky Steamboat & Shane Douglas to win & retain the Tag Team Championship or how they would mock Ric Flair & Arn Anderson by hosting their own version of Ric Flair’s Flair For The Gold interview segment that he was doing at the time, A Flair For The Old. Unfortunately Pillman got injured in the summer of 1993 and events transpired that led to the Blondes being split up before they could get even hotter than they were at the time. Austin joined Col. Robert Parker’s Stud Stable and got the singles push he had been hoping for, winning the United States Championship at Starrcade 1993 over Dustin Rhodes. He held it until August 1994, when Ricky Steamboat would defeat him for the title just like he’d defeated him for the Television title a couple of years before. Austin learned a lot in his matches with Steamboat, but unfortunately Steamboat had to retire after a match with Austin & vacated the US title at Fall Brawl 1994. Austin was awarded the title…only to lose it to “Hacksaw” Jim Duggan in 35 seconds. It was around this time that Austin fell out of favor with WCW management, as they didn’t think a wrestler in black tights & black boots was marketable enough for them to build around. He also suffered a knee injury & a triceps injury pretty close to each other, which was reason enough for Eric Bischoff to send Steve the FedEx that would end up changing his career for the better. Austin’s first stop after WCW was Extreme Championship Wrestling. His former manager in the Dangerous Alliance was running things creatively, and he gave Austin a chance to let some steam off after getting fired. Steve took advantage of it and cut some amazing promos that gained attention from fans that didn’t know he had it in him. The “Extreme Superstar” spent a brief time period in ECW before getting the call from the World Wrestling Federation, and people were excited about Steve Austin getting a shot in the WWF…until they saw the debut of The Ringmaster. Austin & pretty much everybody else associated with The Ringmaster idea has admitted that it sucked. After Austin had proved in ECW that he could cut a money promo & had the personality to be a superstar, he was given Ted DiBiase as his manager & wasn’t allowed to talk or show any personality. A documentary on a serial killer known as the Iceman gave Austin the idea for a new persona, and after rejecting some horrible names given to him from the creative team, Austin received his new name when his wife Jeannie told him to hurry up and drink his tea before it got stone cold. The WWF was discovering its Attitude, and Stone Cold Steve Austin personified their new direction. While he was still a “bad guy”, you could see the fans starting to get behind Stone Cold more with each passing week. He adopted the middle finger salute as his hand signal, which got thousands of kids detention at their schools. 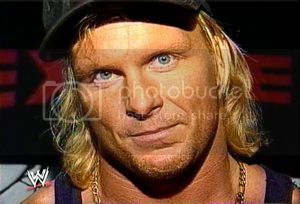 Injuring his old buddy Brian Pillman and then showing up at his house only to be turned away by a gun-toting Pillman gained more attention & made for compelling television, though network executives & sponsors weren’t too thrilled with it at the time. After his victory at King of the Ring he would begin feuding with the returning Bret “Hitman” Hart, calling him out at every opportunity. During the course of the feud the fans that had supported Hart throughout most of his career with the WWF began turning against him. Hart represented the old WWF & the old style of being a top “good guy” while Austin represented the future. The future would become the present at WrestleMania 13 in Chicago, Illinois, where Hart defeated Austin in a bloody & brutal “I Quit” Match where Austin refused to quit but lost after he passed out from the pain of the Sharpshooter. Hart continuing to administer punishment until being detained by guest referee Ken Shamrock made the double-turn complete, and the fans that had already accepted Austin as their guy were given more reason to cheer him. Everyone would learn that Vince McMahon was much more than an announcer, especially after his involvement in Bret Hart losing the WWF title to Shawn Michaels at Survivor Series 1997. Michaels would end up being the man that passed the torch to Austin at WrestleMania 14, after a feud involving “Iron” Mike Tyson that garnered mainstream media attention and helped get the WWF & Austin on the map. After winning the title Austin began an extended feud with Mr. McMahon, who had left the announce booth to focus on his duties as owner of the World Wrestling Federation & getting the WWF title off of Stone Cold. The Austin/McMahon feud would revolutionize pro wrestling and set the template for countless wrestler vs. authority figure feuds in the future. None of them would attain the same level of success that Austin vs. McMahon had, as there was nobody that could play the authority figure as well as McMahon or the disgruntled employee as well as Austin. Austin spent 1998 & 1999 feuding with people that along with him are still remembered among the greatest WWF superstars of all time. The Rock, Mick Foley, Undertaker & Kane were his most regular challengers, but it would be another man that would be given credit for taking Austin out of action at Survivor Series 1999. Austin needed time off, as his body was starting to break down from the years of wrestling & injuries suffered. While it was Rikishi that ran him over with a car for the Rock & for the people, it was Triple H that was the mastermind behind the plan. Austin feuded with him upon his return in late 2000, but would join forces with the Game after WrestleMania X-Seven. Austin won the WWF title from The Rock in the main event of the show that most people consider the apex of the Attitude Era, but he enlisted the help of Mr. McMahon to do so. Stone Cold was never really treated like a bad guy by the WWF fans no matter what he did, but it did result in some very entertaining television during 2001. Austin & Kurt Angle killed time while injured taking part in hilarious backstage segments where they’d try to get McMahon’s attention. The biggest thing to happen during Austin’s heel run was the beginning of his “What?” catchphrase. He began saying it between sentences of his promos, and it caught on like gangbusters with the fans. Austin continued using “What?” in his promos after turning face at the end of the Invasion storyline, and for years afterward fans would use it between sentences spoken by people they don’t particularly care to hear from. The fact that fans still say “What?” during promos to this day just illustrates the greatness of Stone Cold., and the fans that complain about it don’t get it. Austin’s body continued to break down while World Wrestling Entertainment was going through a creative dry spell, and after several conflicts with management Austin decided to walk out on the company. It was a combination of frustration & physical problems that forced Austin to the sidelines, and after several months off he returned to WWE early 2003. Austin’s final match was at WrestleMania XIX in Seattle, Washington, where he lost to his longtime rival The Rock. As of this writing it remains Austin’s last match, though rumors of his return to the ring pop up at least once or twice a year. Austin ended his career as a six-time WWE Champion, a three-time Royal Rumble winner, two-time Intercontinental Champion & a four-time Tag Team Champion, each time with a different partner. Stone Cold has reappeared on WWE television since his in-ring retirement on many occasions. In 2003 he served as co-General Manager of Raw with Eric Bischoff, and in 2004 he became the Sheriff. He’s guest refereed matches on occasion, including the Bobby Lashley vs. Umaga match at WrestleMania 23 that resulted in Mr. McMahon getting his head shaved. He served as host of Tough Enough in 2011. Vince McMahon has gone on record declaring Stone Cold Steve Austin as the greatest WWE Superstar of all time. His rise to the top of the World Wrestling Federation coincided with the company regaining its position on top of the wrestling world and the greatest amount of mainstream media coverage given to wrestling since the Rock & Wrestling era. To this day, people debate whether Austin or Hulk Hogan was the biggest wrestling star of all time, and the fact that it’s even debatable shows just how big Stone Cold was. The man that WCW deemed “unmarketable” became one of the most popular pro wrestlers of all time and a man that carried a company further than any man before him had. Stone Cold Steve Austin is a slam dunk inductee into any wrestling hall of fame, and I consider it an honor to induct my favorite wrestler of all time into the 411 Wrestling Hall of Fame.